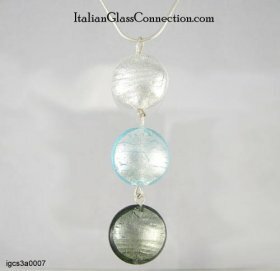 Each handmade Murano glass bead measures 18mm. Bead colors: White (Clear on Silver Leaf), Light Blue on Silver Leaf &Â Black Diamond (Grey) on Silver Leaf. There is a larger version of this necklace.